Alan Olav Walker (born 24 August 1997) is a Norwegian DJ and record producer, born in Northampton, United Kingdom. He is best known for his 2015 single "Faded" which received diamond certification in Germany and multi-platinum certifications in over 10 countries including the US and the UK. He released his debut studio album, Different World, in 2018. He was ranked 36th on DJ Mag's Top 100 DJs list of 2018. Alan Walker is the son of Hilde Omdal Walker, a Norwegian, and Philip Alan Walker, an Englishman. By birth, he was granted dual citizenship, both in Norway and the United Kingdom on the basis of his parental origin. At the age of two, he moved to Bergen, Norway with his parents and siblings. Walker grew up with two siblings, an older sister, Camilla, born in England, and a younger brother, Andreas, born in Norway. 2012–2015: Music debut and "Faded"
In 2012, Walker was listening to a song by Italian DJ David Whistle (also known as DJ Ness) and reached out to him to find out how he produced his music. He was inspired by EDM producers K-391 and Ahrix, and by film composers like Hans Zimmer and Steve Jablonsky. He started producing his music on his laptop using FL Studio. In July 2012, with the help and feedback from his fans online, he began pursuing his music production career and slowly began posting his music to YouTube and SoundCloud. Started as a bedroom producer, he was better known as DJ Walkzz before signing a record deal and releasing his debut single in 2014. Walker released the track "Fade" on 17 August 2014. The track gained attention after its re-release via the record label NoCopyrightSounds on 19 November. Walker stated that the creation of the track was inspired by K-391 and Ahrix, whose tracks were also picked up by the record label. The track has over 370 million views on YouTube, 79 million plays on Spotify, and 35 million streams on SoundCloud. The tracks "Spectre" and "Force" followed in 2015. Walker signed with MER Musikk under Sony Music Sweden and released his next single, "Faded", a remastered vocal version of "Fade". It was released on 8 December 2015 and featured uncredited Naustdal pop singer Iselin Solheim. The single topped the year-end charts in Austria, Germany, Switzerland and Sweden, iTunes charts in 33 countries, as well as entering top 10 in Spotify Global Chart. The music video on YouTube has over 2.2 billion views and 15 million likes, placing it among the top 10 most liked YouTube videos. It has over 780 million plays on Spotify, and is also one of the Top 10 Most Shazamed tracks of 2016. The single also received official remixes from Tiësto, Dash Berlin, and Hardwell. He later released an acoustic "restrung" version of the song, with all the EDM elements taken out. 2016: Live debut, "Sing Me to Sleep", and "Alone"
Walker quit high school in January to pursue his music career. On 27 February, Walker made his performance debut at the Winter X Games in Oslo, where he performed 15 tracks including the song "Faded" together with Iselin Solheim. By March, Walker had produced 30 to 40 songs in total, but "Faded" marks his first single with Sony Music Sweden, and the first to achieve such global success. On 7 April, Walker teamed up with Swedish singer Zara Larsson at the Echo Awards in Germany. Together they performed each other's songs "Faded" and "Never Forget You". Four weeks previously, he achieved the first place on NRJ Euro Hot 30 for the first time, which only has been achieved by one other Norwegian artist, Kygo. The single "Sing Me to Sleep" was released on 3 June, featuring female vocalist Iselin Solheim, the same vocalist in "Faded". The song topped iTunes charts in 7 countries. Its music video on YouTube has over 400 million views, and it also reached 170 million plays on Spotify. The single "Alone" was released on 2 December, featuring uncredited Swedish singer Noonie Bao. The music video on YouTube has over 740 million views, the track also gained over 210 million plays on Spotify. The song was described as "the final piece of a trilogy consisting of 'Faded', 'Sing Me To Sleep' and 'Alone'" by Gunnar Greeve, Walker's manager and co-writer for the single. On 21 and 22 December, Walker held the concert "Alan Walker is Heading Home" in his hometown Bergen at USF Verftet, where he performed 16 songs and tracks together with Angelina Jordan, Marius Samuelsen, Alexandra Rotan, Yosef Wolde-Mariam, and Tove Styrke as singers. The concert was officially live-streamed on YouTube. He premiered several unreleased tracks, including a restrung version of "Sing Me to Sleep", as well as "Sky" and "Heading Home", the latter of which was first performed during his debut at Winter X Games. The song "The Spectre", a remastered version of his earlier track "Spectre", was also performed during the concert. On 23 December, Walker released the video for the single "Routine", which premiered on his concert in Bergen two days earlier and on some concerts on the "Walker Tour". The track was made in collaboration with David Whistle. Its music video on YouTube has over 30 million views, and 23 million plays on Spotify. 2017: "Tired", "The Spectre", and "All Falls Down"
At the beginning of 2017, Walker's YouTube channel became the most subscribed channel registered in Norway, after passing about 4.5 million subscribers, and had the most views among Norwegian YouTubers at around 3.4 billion views as of 10 February 2018. On 7 April, Walker released the song "Ignite" instrumental version, which featured Norwegian music producer and songwriter K-391. It was released as a promotion of the launch of the Sony Xperia XZs smartphone. On 19 May, Walker released his first song with a male vocalist, Irish singer-songwriter Gavin James, titled "Tired". Walker said that the song "adds another dimension" to his productions. Its music video on YouTube has over 102 million views. On 9 June, his collaboration with Dane Alex Skrindo, "Sky", was released on the compilation Insomniac Records Presents: EDC Las Vegas 2017. Its music video on YouTube has over 36 million views. On 15 September, he released "The Spectre", a revamped version with vocals of his 2015 single "Spectre". The single’s music video contains footage of his concerts, along with a team of dancers dressed in white jumpsuits and black helmets. The video currently has over 560 million views. On 27 October, Walker released the song "All Falls Down", which featured American singer Noah Cyrus and British DJ and record producer Digital Farm Animals. The video storyline follows the visual for his previous song "Tired". Its YouTube music video has been viewed over 164 million times. During his 2018 Ultra Music Festival Miami set, Walker was joined by Dutch DJ Armin van Buuren on stage, where they debuted "Slow Lane", their new collaboration. However, the record did not end up being featured on his album, and as of March 2019, it has yet to be released. In April, he performed at the 2018 Coachella, a music festival held in Indio, California. On 11 May, Walker and Norwegian music producer K-391 (Kenneth Nilsen) released "Ignite" vocal version, which featured Norwegian singer Julie Bergan and South Korean singer Seungri. The music video was released on 12 May on K-391's YouTube channel because Nilsen was the lead artist of this single. Its YouTube music video has been viewed over 100 million times. On 27 July, he released "Darkside", featuring Au/Ra from Ibiza and Norwegian singer Tomine Harket, daughter of A-ha vocalist Morten Harket. On 21 August, he released a re-boot of his 'Unmasked' vlog series, in which he films behind the scenes of his concerts and personal life. On 30 August, he released a remix of "Sheep" by Exo member Lay. On 28 September, he released the single "Diamond Heart" featuring Sophia Somajo. On 30 November, he released the single "Different World" from his debut studio album of the same name. The album was released on 14 December. It contains the following new songs: Lost Control (featuring Sorana), I Don't Wanna Go (featuring Julie Bergan), Lily (featuring K-391 and Emelie Hollow), Lonely (featuring Steve Aoki, ISAK, and Omar Noir), and Do It All For You (featuring Trevor Guthrie). 2019: "Are You Lonely", "On My Way"
On 22 February, Walker released the single "Are You Lonely", featuring American DJ Steve Aoki and ISAK. It is a remix of the original song Lonely from his debut album Different World. On 21 March, Walker released the single "On My Way", featuring Sabrina Carpenter and Farruko. Walker was originally known as "DJ Walkzz" or "Walkzz" when he was starting out. He ended up using his real name, Alan Walker, as his artist name after signing up with a record label. He designed his logo in 2013, a symbol consisting of intertwined letters "A" and "W" which are the initials of his name. He uses a hoodie and face mask when he performs on stage. When asked why he uses a mask during an interview by NRK, he stated that "It is to keep a low profile while maintaining the mental image they have given me. I think it's pretty cool. A little twist that makes people ask themselves questions about who really is the person behind Alan Walker." On an episode of his Unmasked series, he stated that "The mask is more of a sign and a symbol of unity and being alike each other, rather than me being different." ^ Litleskare, Tord (8 December 2017). "Feirer bursdagen i hjembyen med massivt show". gaffa.no (in Norwegian). GAFFA. Retrieved 10 October 2018. ^ a b c d "Alan Walker talks fame, gaming and music-making". DJ Mag. 11 March 2018. ^ DJ Mag staff; Guttridge-Hewitt, Martin (11 October 2018). "Alan Walker". DJ Mag. Retrieved 2 November 2018. ^ "Spellemannprisen 2016, Årets låt - Faded". NRK. Retrieved 28 February 2018. ^ "Alan Walker: Unmasked (Episode 3)". Alan Walker on YouTube. Retrieved 28 February 2018. ^ "Alan Walker droppar maska". NRK. 9 November 2016. ^ "Alan Walker - Q&A #1". YouTube. 12 August 2016. ^ "Alan Walker - Fade". YouTube. Retrieved 12 July 2017. ^ "Fade - Alan Walker". Spotify. Retrieved 1 January 2018. ^ "Alan Walker - Fade [NCS Release]". SoundCloud. Retrieved 17 January 2017. ^ "Best Songs We Heard This Week: Jeremih, The 1975, Alan Walker + More". ^ "Alan Walker - Faded". YouTube. Retrieved 29 March 2017. ^ "Faded - Alan Walker". Spotify. Retrieved 10 December 2016. ^ a b Blake, Emily. "Alan Walker, the 18-year-old behind that 'Faded' song, tells us what's next". ^ "Alan Walker: From Bedroom Producer to Official Sia Remixer". Billboard. Retrieved 10 December 2016. ^ "EXCLUSIVE: Interview with 'Faded' hit maker Alan Walker". Retrieved 18 January 2017 – via CelebMix. 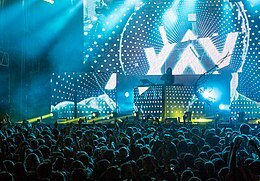 ^ "DJ Alan Walker celebrates X Games Oslo". X Games. ESPN. 1 March 2016. Retrieved 13 March 2016. ^ "Alan Walker @ X Games Oslo 2016 - Live Tracklist". 2 April 2016. ^ "Big in Germany: Se Alan Walker feat. Zara Larsson på tyske Grammy's". ^ "Se Zara Larsson gjøre Alan Walkers Faded" [See Zara Larsson do Alan Walker's Faded]. NRJ.no (in Norwegian). 4 November 2016. ^ "Alan Walker - Sing Me to Sleep". YouTube. Retrieved 17 January 2017. ^ "Sing Me To Sleep - Alan Walker". Spotify. Retrieved 10 December 2016. ^ "Se Alan Walkers Ulriken-video her. Nå skal den ut til hele verden". Bergens Tidende. bt.no. 2 December 2016. ^ "Alan Walker - Alone". YouTube. ^ "Alone - Alan Walker". Spotify. Retrieved 17 January 2017. ^ "Alan Walker - The Making of Alone (Behind The Scenes)". YouTube. Alan Walker. ^ Alan Walker (11 January 2017). "Alan Walker - Alone (Live Performance)" – via YouTube. ^ "Alan Walker is Heading Home Bergen, Norway 2016 - Live Tracklist". 22 December 2016. ^ "Alan Walker is Heading Home". ^ "Routine - Alan Walker". Spotify. Retrieved 3 February 2017. ^ "Toppliste for norske Youtubere – Nordic Screens". ^ "Alan Walker ft. Gavin James - Tired". YouTube. 19 May 2017. Retrieved 28 June 2017. ^ Matthew Meadow (7 June 2017). "Alan Walker Drops New Track on EDC Compilation with Alex Skrindo". Your EDM. Retrieved 9 June 2017. ^ "Alan Walker Brings the Feel-Good Vibes With Noah Cyrus & Digital Farm Animals on 'All Falls Down'". Billboard. Tatiana Cirisano. Retrieved 27 October 2017. ^ "Alan Walker - All Falls Down (feat. Noah Cyrus with Digital Farm Animals)". YouTube. 27 October 2017. Retrieved 15 September 2018. ^ "Alan Walker & Armin van Buuren - Slow Lane". YouTube. 30 March 2018. ^ "Coachella 2018 Lineup". Stereogum. Retrieved 21 March 2019. ^ a b "K-391 and Alan Walker Releases Gorgeous Vocal Version of 'Ignite'". EDM Sauce. 11 May 2018. ^ "Innovative artist concept K-391 releases debut single, "Ignite" featuring Alan Walker, Julie Bergan and Seungri". Vents Magazine. 11 May 2018. ^ "BIGBANG's Seungri Teams Up With DJ Alan Walker And Julie Bergan For Special Collaboration". soompi. 9 May 2018. ^ "Alan Walker & K-391 release a refreshed version of 'Ignite,' with Julie Bergan and SEUNGRI". Dancing Astronaut. 4 June 2018. ^ "K-391 & Alan Walker - Ignite (feat. Julie Bergan & Seungri)". YouTube. 12 May 2018. ^ Fold, The. "Alan Walker - Darkside feat. Au/Ra & Tomine Harket". Alan Walker. Retrieved 6 August 2018. ^ "Lay – Sheep (Alan Walker Relift)". Alan Walker. Retrieved 2 September 2018. ^ "Alan Walker feat. Sophia Somajo - Diamond Heart (Trailer)". YouTube. 22 September 2018. Retrieved 22 September 2018. ^ Walker, Alan (16 November 2018). "Alan Walker: Different World (Trailer)". Retrieved 16 November 2018 – via YouTube. ^ NRK (9 July 2016). "Norges nye stjerne Alan Walker om suksessen: – Magisk". ^ "Alan Walker's third episode of his 'Unmasked' series - EARMILK". EARMILK. Retrieved 9 March 2018. ^ "Alan Walker locked to play DJ Mag Miami Pool Party". DJMag.com. DJ Mag Staff. 28 February 2018. ^ Meier, Sam (13 November 2018). "Alan Walker Announces 'Different World Tour'". promotionmusicnews.com. Retrieved 16 November 2018. ^ "Alan Walker varmer opp for Rihanna". vg.no. 23 June 2016. ^ "Alan Walker to join Justin Bieber on India Tour". India Today. 8 April 2017. ^ Andrew Rafter (9 June 2017). "Martin Garrix Reveals Full Line-Up For Thursdays at Ushuaïa in Ibiza". DJ Mag. Retrieved 13 June 2017. 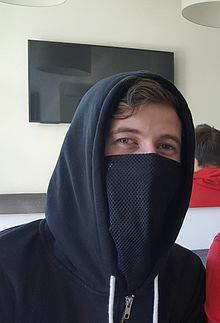 Wikimedia Commons has media related to Alan Walker (music producer).